When things were beginning to unravel in early June, Fernando Nieve burst on the scene and filled a huge hole in the starting rotation — only to be befallen by the injury bug a month later. Before going down with a season-ending leg injury, Nieve posted a sparkling 2.95 ERA through 7 starts and 36 innings. He had a stretch of three straight spectacular outings in mid-June, when he went 6+ innings in each and allowed a grand total of 3 earned runs through 18 2/3 IP. He was on the verge of being the Mets’ biggest success story when his quadriceps muscle gave out on an infield grounder, and became one of the infamous “backups to the backups” who went to the DL. The numbers look good, and our memories return fond memories, but what can we really expect from Fernando Nieve going forward? First of all, he has to come back 100% healthy from a major tear in his thigh. That’s simple enough, but there are two other related considerations. First of all, he has to heal and rehab under the Mets’ guidance — and you know how well that’s gone. We can only hope that since the season is over, better and more conservative decisions are made in regard to rehab. We also must cross our fingers that Nieve has remained active during his time away from the field — the memory of Duaner Sanchez bloating to whale-like proportions during his recovery still sticks in the mind. Of course, Nieve is not Sanchez, and so it’s not fair to suggest that Nieve has been irresponsible about his conditioning — truth is, we haven’t heard anything about Nieve since that fateful day in Atlanta. The second consideration is his elbow. Nieve had Tommy John surgery in late 2007, and it generally takes about two years to make a full recovery. However, THAT recovery was stunted by the leg injury, which means he could be another 6 months behind. Though, he was touching 96 MPH occasionally, which is fast enough to be successful. Whether he ever makes it all the way back to the 98-99 MPH velocity that made him a top prospect with the Astros is questionable, but it may not matter — if he can continue to display that nasty change-up. In his short stint, Fernando Nieve showed flashes of brilliance. He definitely has the ability to make big-league hitters swing and miss, but his command and consistency are both sketchy. After missing a year due to the TJ surgery, what Nieve needed most was to log innings, and instead he suffered another setback to his once-promising career. Personally, I believe Nieve has the raw stuff to fill a role on a championship pitching staff. At the very least, his hard sinking fastball is a plus pitch and on its own, enough to make him an impact middle reliever / swing man — think Ramiro Mendoza of the 1997-2002 Yankees. But he really needs to throw as much as possible to gain command of that sinker and his sometimes-lethal change. Only 27 years old, he still has time on his side — but will the Mets have the patience? In an ideal situation, Nieve starts the year in AAA as a starter and gets in the innings needed to polish off the rough edges — and return as either a decent back-end starter or a strong middle reliever / setup man. What’s more likely to happen is this: he’ll light up the gun at 96-97 MPH early in spring training and immediately be slotted into a bullpen role. As a reliever, he won’t get the necessary reps to develop his command (see: Bobby Parnell) and will be an inconsistent situational reliever who frustrates his manager and pitching coach, because he “has all the tools but can’t seem to put it together”. Back Mets: Who’s the Boss? Next Teufel Back – Wally Next? Somehow I think if the Mets had to choose between handing a 2010 roster spot to Nieve or to Tim Redding, they’d go with Redding. I dare them to proove otherwise. In think the article sells Nieve short. He shut down the Yankees, Rays and Cardinals in succession. His performances thereafter were somewhat spotty against the Brewers & Phillies, but I was left with the sense that he dominate opponents with regular work after full recovery from TJ surgery. Given the entire context of last season, his leg injury will give his right arm more time to heal. I expect big things from Mr. Nieve next year. I hope Omar has the acumen to consider him for a spot in the rotation. Omar’s judgement is more at question than Nieve’s capability. Tommy – thanks for the comments. I agree that Nieve was impressive, but he shut down teams that had never seen him before, and that could have been an advantage. 7 games is too small a sample size to make a definitive conclusion one way or the other. Consider the case of Jorge Sosa, who looked like Cy Young until he was over-exposed. I think my evaluation is pretty fair — I did state that I can see him on a championship staff, after all. 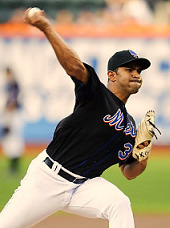 Further, Nieve was a pitcher who needed more time / reps to develop his skills BEFORE the elbow injury. Agreed on Omar’s ability to judge.